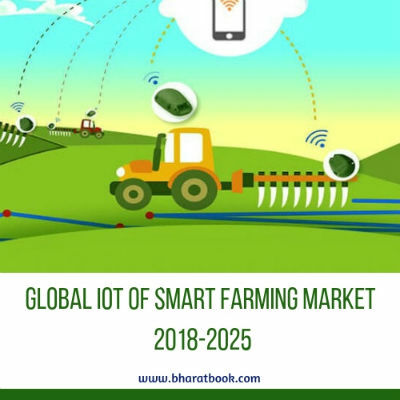 Bharat Book Bureau Provides the Trending Market Research Report on “****** IoT of smart farming Market Size study, by Type (Hardware, Software, Services), Application (Water Supply Management, Precision Agriculture, Integrated Pest Management/Control) and Regional Forecasts 2018-2025”under Food & Beverage Category. The report offers a collection of superior market research, market analysis, competitive intelligence and Market reports. ****** IoT of Smart Farming Market to reach USD 6.4 billion by 2025. ****** IoT of smart farming Market valued approximately USD 1.7 billion in 2017 is anticipated to grow with a healthy growth rate of more than 18.00% over the forecast period 2018-2025. The major driving factor of ****** IoT of smart farming Market are increasing IoT solutions for remote monitoring and reduction in cost of sensors. One of the major restraining factors of ****** IoT of smart farming market is high initial cost requirement for IoT integration in smart farming. Internet of Things (IoT) of smart farming is a system in which monitoring the crop field with the help of sensors (Light, Humidity, Temperature Soil Moisture, etc.) and automating the irrigation system. Farmer can monitor their crop field conditions from anywhere. The major benefits of IoT of smart farming are it optimizes crop treatment such as accurate planting, watering, pesticide applications and harvesting directly affects production rates. With the help of Internet of Things (IoT), farmers can visualize production levels, soil moisture, sunlight intensity and more in real time and remotely to accelerate decision making process. It can be monitored and maintained according to production rate, labor effectiveness and failure prediction. Analyzing production quality and results in correlation to treatment can teach farmers to adjust process to increase quality of the product. The regional analysis of ****** IoT of smart farming Market is considered for the key regions such as Asia Pacific, North America, Europe, Latin America and Rest of the World. North America has dominated the market of total generating revenue across the globe due to increase in availability of new technology in farming sector in 2017. Europe is also contributing major share in the ****** market of Internet of vehicle. Asia-Pacific region is also anticipated to exhibit higher growth rate / CAGR over the over the forecasted period 2018-2025.